October 15 – UEFA is boosting its women’s development funding for member associations by an extra €50,000 annually from 2020. Provided via UEFA’s HatTrick programme, which allocates funds to its 55 member associations for development projects, the UEFA Women’s Football Development Programme (WFDP) will now rise from €100,000 to €150,000 per nation. In June 2017 UEFA launched the #WePlayStrong campaign as part of an initiative to change perceptions of the women’s game, encourage girls to play and make football the number one sport for women across Europe by 2020. 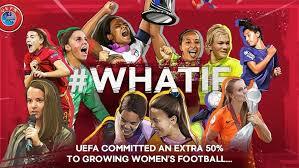 With the increase in grant aid, UEFA is also committing to the #WhatIf campaign – a social media-based initiative created by Women in Football, a not for profit organisation that champions female talent in a bid to bring about a change in attitudes to professional women working in the industry. “We launched #WhatIf nearly five months ago and the support we have received from the football industry and beyond has been immense,” said Ebru Köksal, chairperson of Women in Football. “To now welcome UEFA, the governing body of European football, to join our inaugural campaign is a huge honour. Women’s football in Europe has been encouraged to develop a growth fast track, both in terms of participation and commercially with UEFA unbundling commercial rights from the men’s game to build women’s properties. The 2017 UEFA Women’s EURO in the Netherlands saw a global cumulative live audience of 178 million viewers watching the tournament, while a total of 240,045 spectators beat the previous record of 216,888 at the 2013 finals in Sweden. The expanded Women’s World Cup in France next year will see another progression of the profile and ‘professionalisation’ of the women’s game.